Conservative political activist and mainstream media antagonist James O'Keefe will give a talk about campus free speech in Middlebury Thursday night. The talk comes the same week that the Washington Post reported that his organization, Project Veritas, apparently tried to plant fake news in the paper. The title of the talk is "Middlebury's Problem With Free Speech." That's a reference to controversy around the visit by Bell Curve author Charles Murray to the private college last spring that ended in a near-riot. The visit comes as the college deals with continuing fallout around race relations and free speech from the Murray visit. 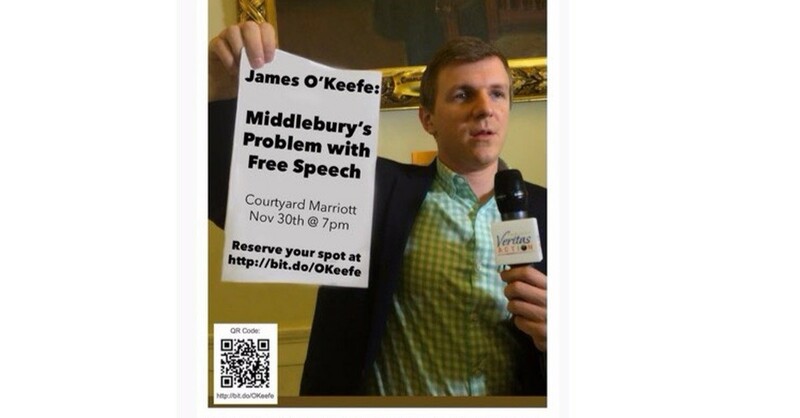 On Tuesday, an email promoting the O'Keefe talk circulated through the Middlebury College campus system. The email said the event was sponsored by a student group called the Preservation Society. A few hours later, the college issued an email of its own saying that it is not sponsoring the O'Keefe event, and that the campus email system was spammed by O'Keefe's group. Middlebury College has nothing to do with this event. Mr. O’Keefe has chosen to travel to town to pursue his own political and personal agenda. We also are unaware of any student group called the Preservation Society, which was named in the email as a host for the event. No one claiming to represent such an organization has approached the College with a request for recognition as a student organization. O’Keefe’s organization, Project Veritas, is known for using false identities, fictitious cover stories, and concealed cameras to target media organizations and other institutions. We recommend you keep this in mind if you are approached this week by someone you don’t know who inquires into your political beliefs or opinions. Project Veritas is famous, or infamous, for undercover videos designed to show liberal bias in the media. O'Keefe's visit to Vermont comes as the story of the apparently botched Washington Post sting captivates the country. On Monday, the Post published a story detailing how a woman approached the newspaper with a fake story of having been impregnated by Moore as a teen-ager and urged to abort the pregnancy. The paper checked the story out but did not find it credible and did not report it. Instead, the newspaper reported on the apparent attempt by Project Veritas to plant fake news in an effort to discredit the newspaper. The Middlebury College Republicans are disappointed that non-college groups are attempting to advance their political agenda by using Middlebury as a location for publicity reasons. The College Republicans have no connection to this event, and would never extend an invitation to an individual known for using false identities, fictitious cover stories, and concealed cameras to target media organizations and other institutions.